A powerful, musical and distinctly satisfying filter. 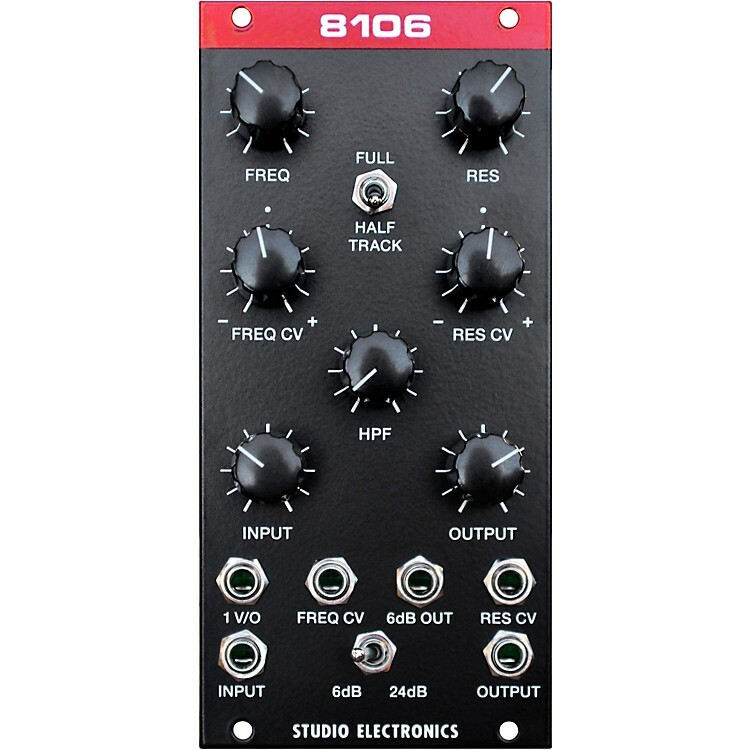 The 8106 Filter by MODSTAR is a 6db/oct hi-pass filter followed by a recreation of the Roland® IR3109 module—a 4-pole, 24db/oct voltage controlled lowpass filter with voltage controlled resonance. Three dual OTAs with similar topology to the BA662 used in the Jupiter 8 (and the IR3109 module) were employed, one amp for the hi-pass filter, four (with added buffers) for the low-pass, and one for the resonance. This filter takes a wide range of input signals, and tracks control voltage extremely well. Tap points are available for 6db, 12db, and 18db/oct. Although the topology is similar to the 4075, the tonality, especially when overdriven, is distinct." Interface and feature Maestro Greg St. Regis, opted for the 6dB over the 12dB/18dB "tap" for the second filter output, due to its colorful, and starkly contrasting character. This INPUT drive hits harder—much faster than MODSTAR's other filters—so there is plenty of dirt to go around, but a familiar and comforting Roland-style quality/tonality/flow is definitely home base, especially with a nice SLIM O top-dead-center square wave is riotously coursing and pulsing through the 8106's veiny through-hole circuitry.